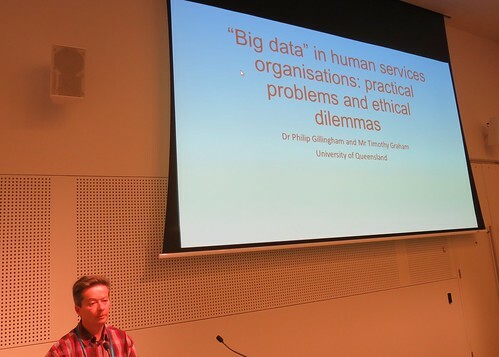 “Big data” in human services organisations: Practical problems and ethical dilemmas. Philip Gillingham (University of Queensland). “Big data” initiatives that aim to bring together and mine data from multiple databases across government and non-government agencies promise new insights into human service delivery. Specifically they aim to provide information about what services are being used, how, by whom and with what outcome. However, the process of achieving such insights poses both practical problems and ethical dilemmas. In this presentation, drawing from an extensive literature review and research with government and non-government human service organisations focussing on the design and redevelopment of electronic information systems, the most significant problems and dilemmas will be explored. It will be argued that current frameworks for ethical social work and human service practice will need to be expanded to accommodate developments in technology which have made ‘Big data’ projects possible.